Freedom Fighters is one of the hidden gems of the last generation, and is a textbook example of why publishers are often wary of releasing games based on original IP. It reviewed well, has a good pedigree, an interesting premise yet still (unless I’m mistaken) bombed at retail. It is a game that sets out to delivery one narrowly-defined premise exceptionally well. Driving the invading forces back, street by street, is immensely satisfying. The squad mechanic works properly and isn’t just for show (while many games since have featured AI controlled squadmates, only a few have made such a system integral to the gameplay). The save system fits the structure of the game perfectly. Even the way shooting while running is handled (mixing autoaim with significantly reduced accuracy) feels right. Unfortunately time hasn’t been kind to the game. The presentation was already somewhat threadbare at the time of release, and looks positively archaic today. Kane and Lynch (from the same team) was widely expected to be a glossy update of the Freedom Fighters formula, but for one reason or another didn’t live up to expectations. A proper sequel is long overdue. Freedom Fighters is a third-person squad-based action game developed by Danish codeshop IO Interactive (best known for their stylish Hitman series of stealth/puzzle games). 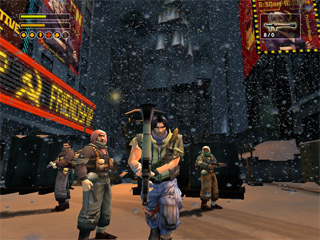 The game is set in an alternate version of New York which has been conquered (along with the rest of the continental United States) by the communist Russians – a scenario lifted fairly shamelessly from a 1986 pen-and-paper RPG by J. Andrew Keith (also called Freedom Fighters, spookily enough). The player assumes the role of Christopher Stone, a Brooklyn plumber who works with his younger brother (where have I heard that before?). The story begins on the day New York is invaded, with the oblivious Stone brothers making a house call only to find their client has gone missing and the place is over-run with Russian troops. After evading capture, events continue to snowball out of control, gradually pushing the reluctant Chris into the role of resistance leader. Nuclear submarines have surfaced in the harbour. Tanks are rolling in the streets. TV news networks are spewing out hate-mongering propaganda (no change there, then). Can Chris save the American Way, or should he have stuck to fixing leaky taps and charging ridiculous fees? In gameplay terms, this situation translates into a series of missions set in discrete (but quite large) areas of the city, interspersed with periods of recuperation at the Rebel Base (initially located in the Brooklyn sewers). A mission zone might contain a number of objectives, some of which might have a positive effect in another mission zone (for instance destroying a helipad will prevent the Russians defending a target with gunships, destroying a bridge will cut off troop reinforcements). 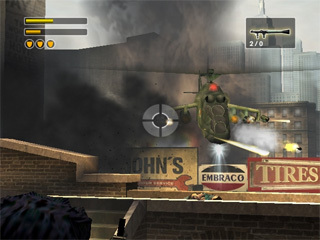 The ultimate objective in each mission zone is to raise the Stars and Stripes above an important building in the area, thereby bringing it under rebel control. At its simplest, Freedom Fighters is played as a third-person shooter (imagine the on-foot sections of Grand Theft Auto III except without the cripplingly awful control scheme). Chris can carry a melee weapon, a pistol and one heavy weapon (assault rifle, shotgun, sub-machine gun, sniper rifle, machine gun or rocket launcher) at a time, and can swap weapons for any he finds lying around. When an enemy is fairly close by and in Chris’s field of vision, the game will employ a limited autoaim functionality. For more distant or precise targeting, depressing the left trigger button (right mouse button) enters a precision aiming mode, drawing the camera close to Chris’s shoulder and drawing a crosshair. Chris can also sneak around to avoid detection, and can jump over and mantle onto ledges and obstacles fairly fluidly. He can also carry a limited number of grenades, molotov cocktails and medical kits. It isn’t long before Chris finds himself outnumbered by Reds, and this is where the game’s best feature comes into play – squad leadership. 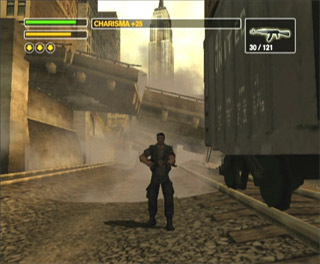 From the start of the game, Chris can walk up to friendly characters and recruit them. They will then follow him, and respond to simple orders. As Chris makes his way through the city, certain noble acts (healing wounded civilians, blowing up Russian buildings, raising the flag) will gain him Charisma points, which fill up a Charisma bar. Each time the bar is filled (which takes progressively more and more points as the game wears on), Chris can command an additional sidekick, up to a maximum of twelve. Squad members can be commanded individually or as a group, to Follow, Scout/Attack, or Stay/Defend. If the player can find a suitable vantage point, they can assign these commands to ‘waypoints’ on the ground, so squaddies can be directed in battle over a large area. The squad A.I. is fairly robust, able to pick its way through complicated routes and detect and engage enemies in hard-to-reach places. Occasionally it will get a little confused indoors (ordering squad members to scout upstairs by gesturing at the stairs will cause them to wait on the stairs – logical, but slightly cumbersome). If a squad member gets seriously wounded, they can be revived by using a medical kit on them. Alternatively, fallen squad members can be replaced by fresh recruits if Chris can find resistance hideouts. The game employs a fairly strict savegame system. 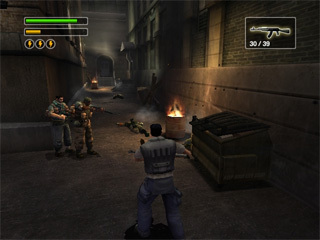 During a mission, a ‘quick save’ can be made if the player finds and opens a manhole (of which there usually less than half a dozen scattered around each area). Quick saves are not kept when the player exits the game, the only way to save progress is to return to the rebel base after completing an objective. Freedom Fighters is, in essence, a ground-level version of Syndicate (except without the vehicles or crowds of civilians, or the cool cyberpunk stylings – but you get the idea). The control scheme is very well implemented, managing to allow for simplified combat without completely removing any element of skill. The emphasis is much more on arcade-style immediacy than excessive simulation, which is a breath of fresh air in a genre mainly populated with SWAT teams and Tom Clancy’s progeny. That is not to say that the game is a mindless shoot-’em-up. The player is constantly challenged to formulate sound strategies and carry them out, making the game as much a test of awareness and judgment as one of reflexes. Things occasionally go awry when the game tries to strike out too far from its core competency. Around the midway point solo missions start to crop up, which although fun in their own right are rather more linear and less satifying than the blood and thunder of block-by-block street battles. 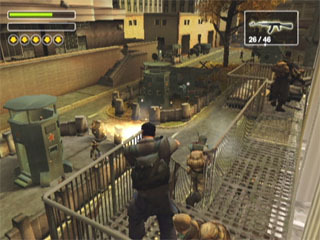 Even taking the solo missions and variety of objectives into account, the game could be characterised as being repetitive. While it’s evident that most of the developers’ efforts went into perfecting the squad A.I., at times it seems that the rest of the game has been neglected as a result. There isn’t much to see or do off of the beaten track in this version of New York. It feels far less alive than Grand Theft Auto III’s Liberty City. There isn’t much for the player to manage or accumulate on a long-term basis, beyond health, ammo and charisma. The squadmates are pretty much personality-free clones, without names or even enough faces to go around. (Often you will have identical twins or triplets in your squad.) And there is little incentive to replay the game once it has been cleared. The game can also be frustrating, but it’s usually frustration of the good, ‘just one more go’ kind. One sour note comes in the form of personnel carriers that drive around some of the mission zones. These seemingly indestructible vehicles will go around the same route forever, always stopping at the same point to disgorge a fresh batch of (far too many) Soviet troops, like some kind of militaristic clown car. Worst of all, if they run Chris over he’s instantly dead, which is a little bit annoying seeing as they’re virtually silent, the player’s field of vision is quite restricted and there’s no other traffic to avoid. Freedom Fighters is one of the rare games (although less so than previously) that has been released on all four major home formats virtually simultaneously. As far as I am aware there is little difference between the versions (apart from the obvious issues of controls, screen resolution, loading times, etc.). Graphically all versions look pretty similar (or to put it another way all versions are held back by the need to support the aging PlayStation 2). Low polygon counts and high resolution textures are the order of the day. The colour scheme is nicely muted (although occasionally makes the world appear to be viewed through a yellow filter), and there are some pleasing spot effects (rising walls of flame, ‘waves’ of rain against rooftops). On the Gamecube version there are some rare instances of ‘sparklies’ (cracks at the edges of polygons) and some slowdown when a very large number of moving characters are drawn on screen. The PC version, which you might expect to look the best, actually shows up the angular nature of the modelling a little too harshly. All versions of the game receive the same benefit when it comes to the audio portion. The sound effects and speech are on the right side of average, with the occasional rogue stereotype slipping in. The musical score (composed by Jesper Kyd and performed by the Hungarian Radio Choir) is a superbly atmospheric fusion of dour Russian chanting and stark Vangelis-like bleepings. No doubt many readers having gotten this far will have some reservations about the game’s overtly jingoistic, trigger happy premise (I know I did). Thankfully, for the most part, IO Interactive have chosen to keep things fairly light-hearted. There is the occasional fist-pumping speech that will no doubt be taken at face value by American conservatives, but for the most part the writers have managed to steer a course between offensive nationalism and obvious parody. Overall, Freedom Fighters is worth checking out if you are partial to action games, especially seeing as many retailers (in the UK at least) are offering it at a knock-down price.